Three years ago, Stacey Jones supposedly played his last game of NRL football at Brookvale Oval. He guided the Warriors to an upset victory over the Manly Sea Eagles and it was a humble way to farewell one of the game’s greatest ever halfbacks. However, it was at the same venue yesterday afternoon against the same opposition where the little general marked his return to first grade in stunning fashion, inspiring the Warriors to a 26-24 victory over the reigning premiers. Indeed, the return of Jones from a three-year hiatus was the icing on the cake in what was a brilliant afternoon of football between two teams blessed with attacking flair and skill. 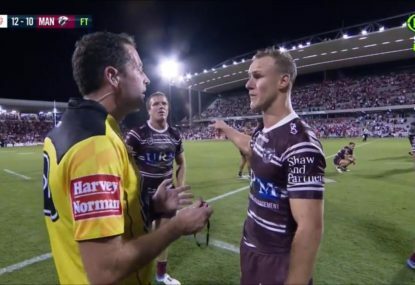 While both the Warriors and the Sea Eagles are renowned for their point-scoring prowess, it was Manly who were showing their capabilities with the football early on. Counting on the form of centre Jamie Lyon, Sea Eagles winger Michael Bani posted the first try of the afternoon, finishing well in the corner. It was only fitting then to see Lyon score Manly’s second try – a work of art between him and Bani that should have set up a dominant victory for the Sea Eagles in front of the Brookvale faithful. Instead of providing Manly with the fuel to finish the Warriors off, they literally ran out of gas in a period the Warriors flexed their offensive muscle. Warriors winger Brent Tate scored the first of the Warriors’ tries, after some good lead-up play by Nathan Fien. Just minutes after the resumption of play, Warriors captain Steve Price executed a set-play that allowed Manu Vatuvei to score untouched. Warriors coach Ivan Cleary was nodding his head while Sea Eagles coach Des Hasler was scratching his. In a comatose period in defence for Manly, Price once again laid on a try for fellow Warriors forward Jesse Royal, to leave the Warriors’ leading 16-10. So after three quick tries that allowed the Warriors to gain control against Manly, the time was right for little Stacey Jones to officially come out of retirement and make his return. 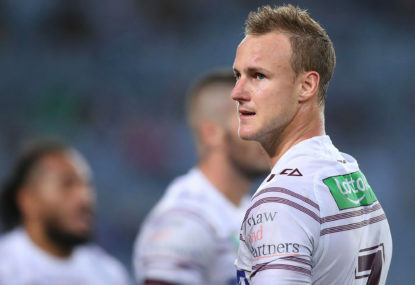 Although there were some fans that appreciated his return to the NRL, most of the Brookvale faithful remained silent, knowing full well the heartache Jones provided them the last time he was in a black jersey. As Jones was given the task of consolidating his side’s terrific form patch early in the second half, things started to unravel in his return to football. Debut winger Andrew Suniula scored early for Manly after the Warriors kicked out on the full from the restart of the second half. It was the momentum shift that allowed the Sea Eagles to swoop on field position and ultimately retain the lead thanks to a lucky try to Adam Cuthbertson. 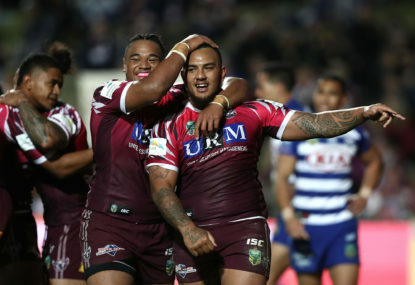 Manly appeared to regain their attacking mojo when Lyon scored his second try to put the Sea Eagles up by eight. In a see-sawing contest, the importance of Stacey Jones’ return to the NRL became clear. In a critical period of the second half, the little halfback chipped over the top, regathered the football, sold a dummy to Michael Robertson and unselfishly provided Tate with his second try. What followed was vintage Jones as he gained a goal-line drop-out from a well-placed kick, while he also provided the cross-field bomb that allowed Jerome Ropati to score the winning try for the Warriors. Indeed, Jones’ performance ignited a premiership dream for the Warriors that is as realistic as ever in their ten-year history. His performance, however, also relived a nightmare the Sea Eagles will find difficult to forget.